Chain-drive openers use a chain similar to the one used in bicycles to operate your overhead garage door automatically. While this technology has certainly been improved upon over the years, and new and more innovating ways have been introduced, chain-drive garage door openers are still quite common due to their affordability. The opener system consists of a motor unit and hardware. Inside the motor unit, there are the gears, the circuit board, the receiver, and the wiring. Nowadays, there are openers that come with DC motors as well as ones equipped with AC motors. 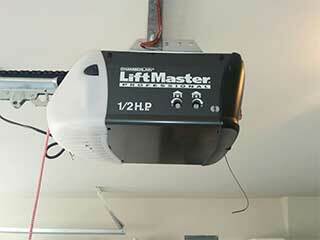 The motor unit is mounted on the ceiling with the use of a bracket. It is set at a precise distance away from the door, corresponding to its height. The rail is the metal hardware component which connects the opener to the wall above the door. The chain runs inside it. It is connected to a sprocket set inside the motor unit and to a matching component on the other side. The trolley is a moving component attached to the chain. A moving arm connects it to the door. The motor starts running when the opener's receiver picks up a signal from the remote control. The power it produces is used to move the gears, as well as the sprocket that's connected to the chain. In this way, the chain starts running inside the rail. The chain runs in the direction of the motor unit in order to open the door. To close the door, it moves in the opposite direction. The chain drives the trolley back and forth respectively and the door follows with the help of the moving arm. Chain drive openers require regular maintenance in order to operate smoothly. Their chain in particular needs to be regularly lubricated, as well as adjusted. This will help keep its noise output to a minimum. If you're looking for more information or would like to see what garage door opener models are available today, then our company can help. Contact Garage Door Repair Encino today.